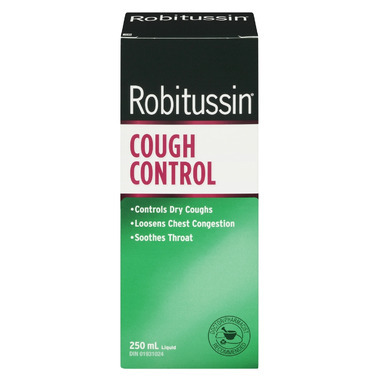 Robitussin Cough Control helps relieve dry coughs and chest congestion, and it includes an added ingredient to loosen mucus and phlegm buildup. Dosage: Adults (over 12 years) take 2 teaspoons (10 mL) every 6-8 hours or as directed by a doctor. Maximum 4 doses per day. NOT FOR USE by children under 12 years. Non-medicinal Ingredients: Alcohol, citric acid, FD&C Red No. 40, FD&C Yellow No. 6, flavour, glycerin, invert sugar, sodium benzoate and water. Caution: Keep out of reach of children. This package contains enough medication to seriously harm a child. Do not exceed the maximum dosage. Do not use if you have an allergy to any of the listed ingredients. Stop use and talk to a doctor if symptoms do not improve in 7 days or if high fever, rash or persistent headache is present, as these could be signs of a serious condition. Talk to a healthcare professional before using this product if you suffer from persistent/chronic cough (as occurs with smoking), shortness of breath or chronic lung disease (e.g. asthma or emphysema), if you are pregnant, nursing, or if you have taken a drug for high blood pressure or depression. DO NOT take with other cough suppressants or expectorants or any other cough and cold medications, unless recommended by a healthcare professional, as harm may occur. Do not use with a monoamine oxidase inhibitor (MAOI) or for 14 days after stopping the MAOI drug. In case of overdose: Stop use and contact a doctor or poison control centre immediately, even if there are no symptoms.